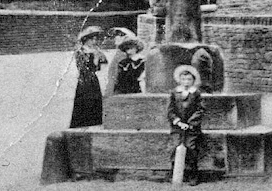 This photo was taken by the late T.W. 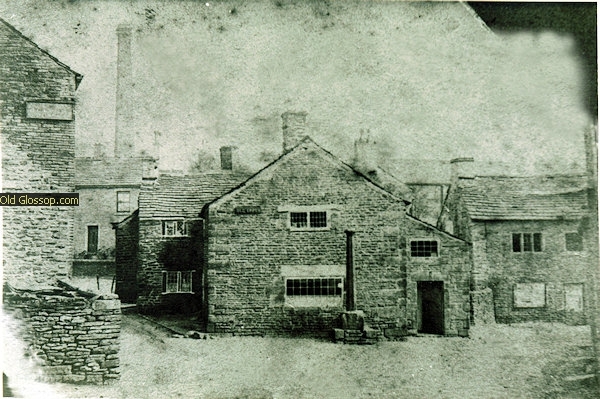 Sharpe in 1895 his grandson Mr.. Neville T. Sharpe (who holds the copyright on it) has kindly given his permission for the photo to be used on this site. 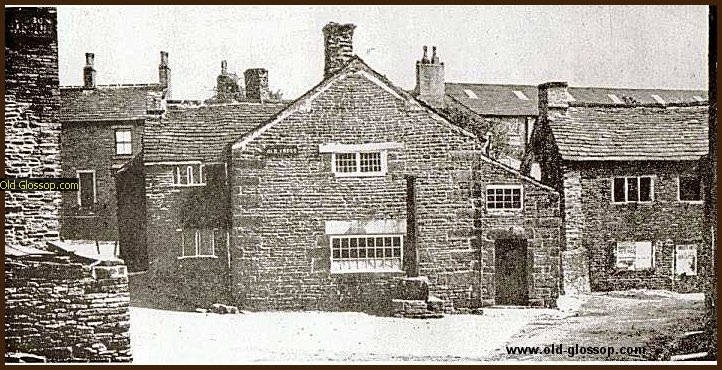 An ancient settlement,Glossop (now Old Glossop) is mentioned in the Doomsday Book of 1086, where it is recorded as being owned by William Peverel, known as 'Peverel of the Peak', who owned extensive estates in Derbyshire and Nottingham and is thought to be the illegitimate son of William the Conqueror. 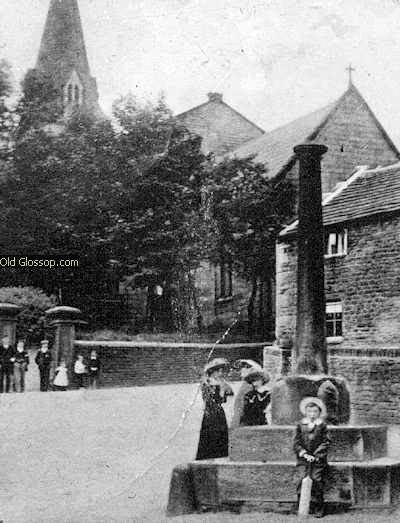 Peverel founded Glossop Castle a motte and bailie fortress just to the north of the town , the earthworks, although damaged, are still visible today. 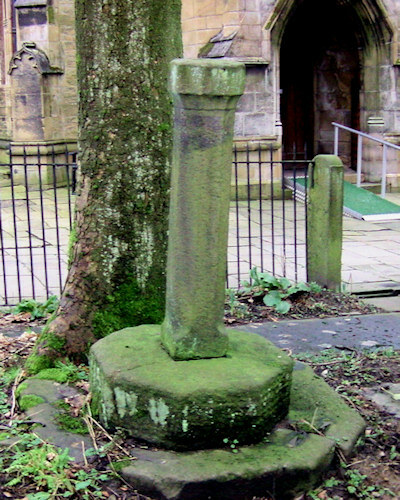 These photos have been taken of what is thought to have been the original Boundary marker( placed by Peverel or one of his descendants ), opposite the Parish Church entrance, where it was placed after being moved to make way for their present larger column. 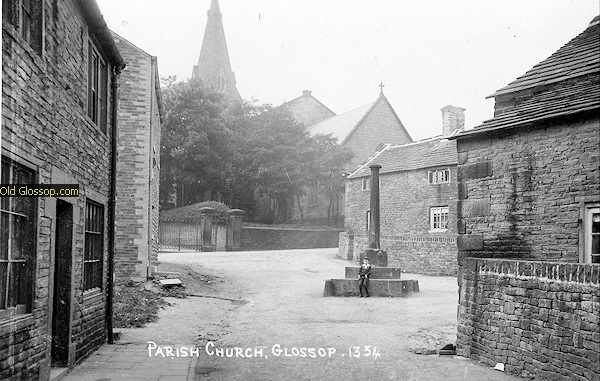 During the mediaeval period, from 1157 to the late 15th century, the lordship rights over the lands around Glossop belonged to Basingwerk Abbey in North Wales. 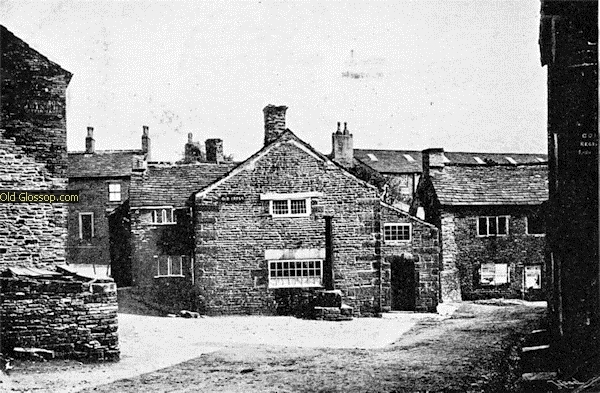 Monks from Basingwerk farmed around Charlesworth, and several times Monks found themselves in court in Glossop for poaching. 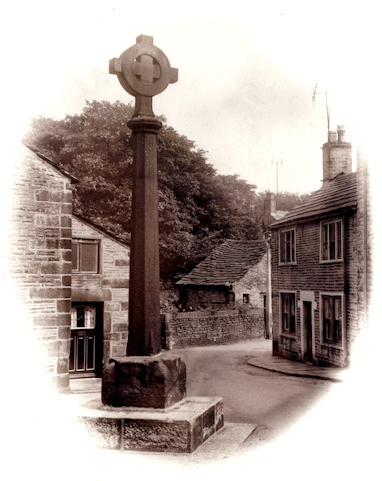 The monks set up markers at a number of locations around Glossop to mark the boundaries of the area they held. 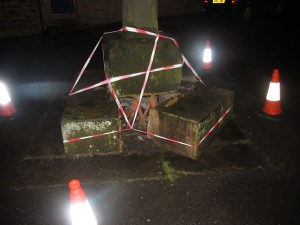 On the night of the 16th of April 2012, a silver VW Hatchback Passat seriously damaged the Old Cross in Old Glossop. 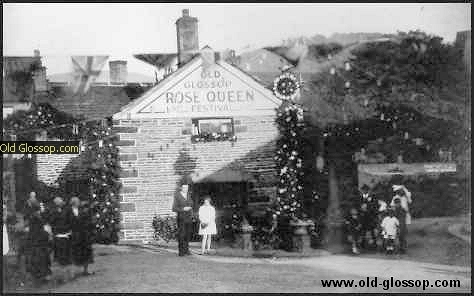 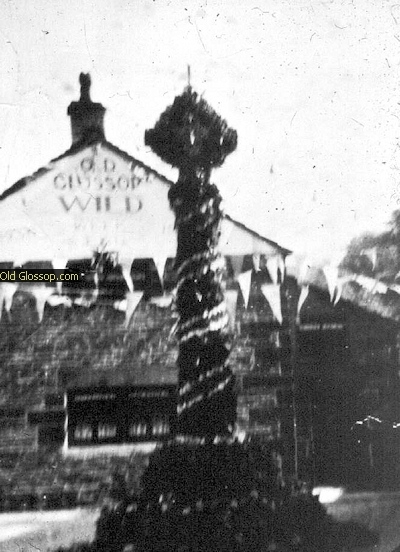 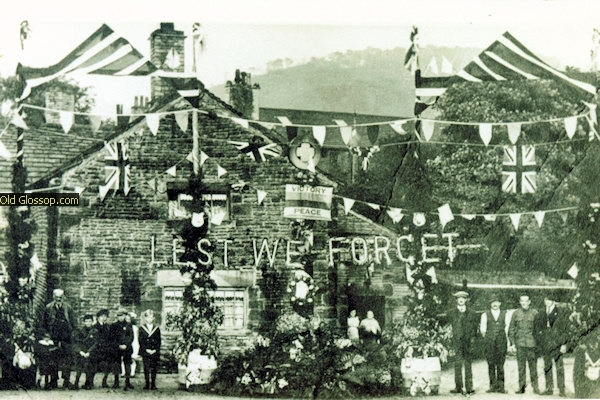 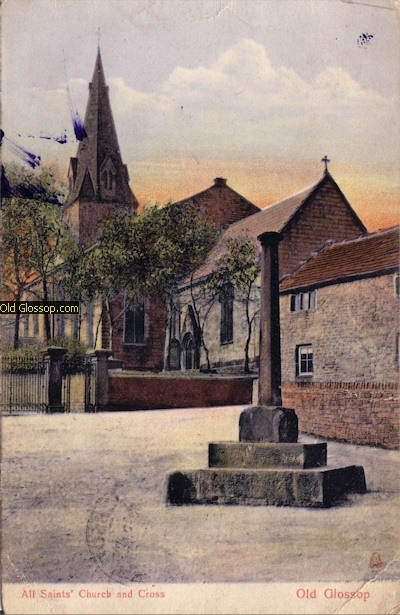 The Old Cross is a historic monument dating from the middle-ages and is seen as a symbol of Old Glossop. 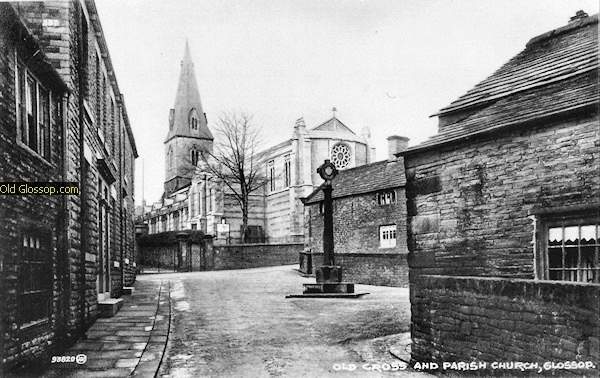 The residents who spoke to the driver said the damage occurred when he tried to reverse out of Old Cross and he didn't’ realize he had struck the Old Cross. 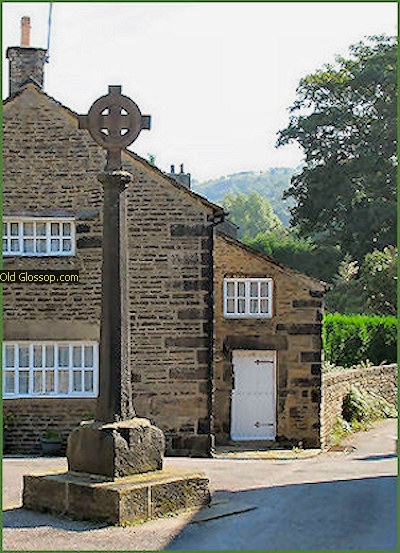 Residents of Old Glossop are shocked at what has happened and want to see the damage repaired and the Old Cross restored as quickly as possible. 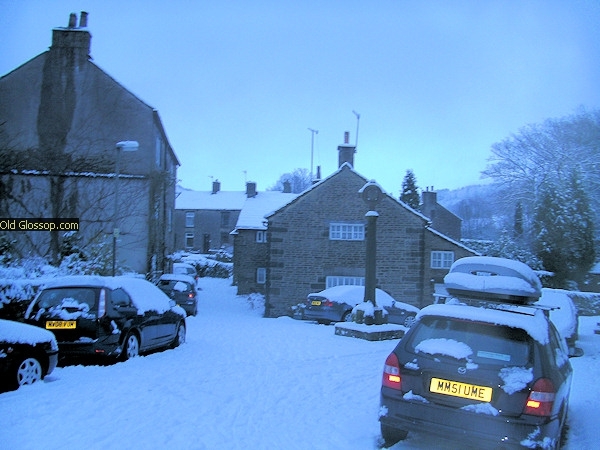 The Police and Derbyshire Highways were called. 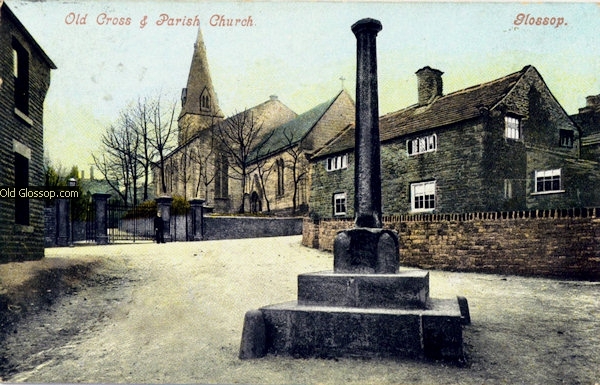 They have assessed the cross as being stable but in need of urgent repair. 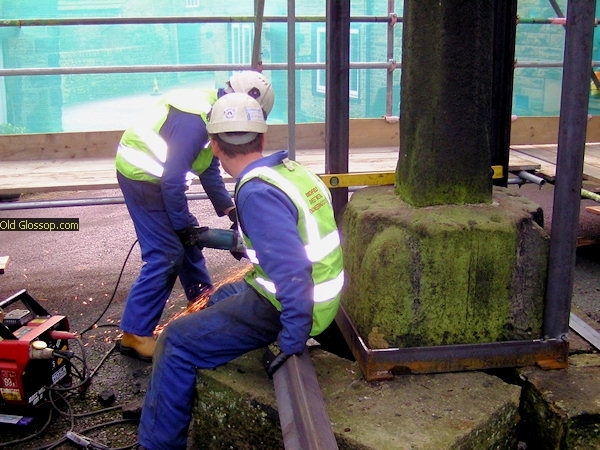 The residents have insisted that a structural surveyor inspects the Monument about the need to ensure that not only is the Old Cross repaired but restored. 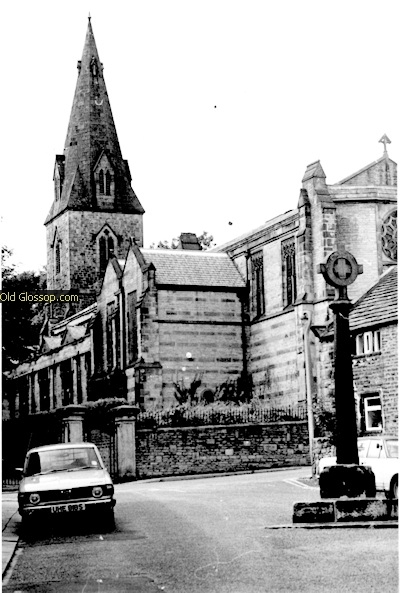 However some blame must be carried by the Highways department who first covered the original cobbles with tarmac and then continued to add more tarmac on top year in year out. 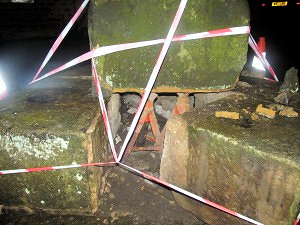 The following three sequential photos show the original base being covered by layers of tarmac. It also shows that our forefathers had enough sense to put stone bollards at the corners of the monument to protect it from horse cart wheels. 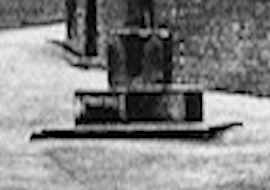 I hope that British Heritage insists that the original base be exposed and the tarmac removed to show the original cobbles. 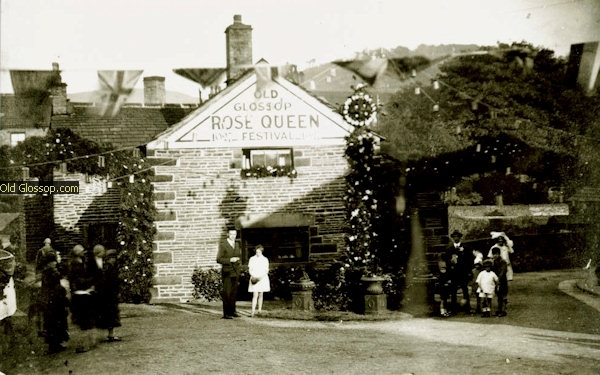 This work would also ensure that future minor local floods would not effect cottages in this attractive area of Old Glossop. 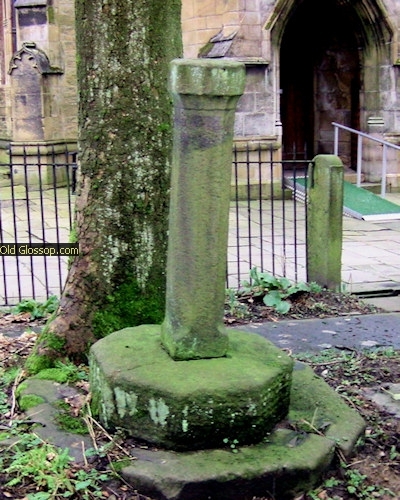 The cross-shaft is said to date from 1290, and although it looks reasonable enough in itself, it sits rather uncomfortably on the top of this ancient monument. 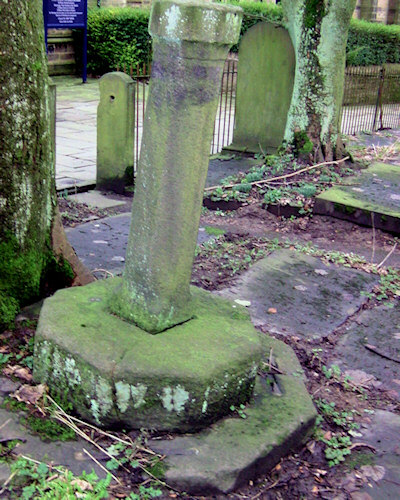 The cross was made by Stonemason Horice Goddard (Jim Goddard's father) who was part of the family firm Potts and Goddard. 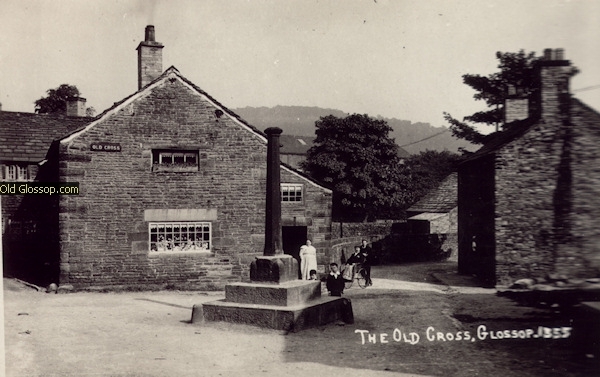 The pattern for the cross was still saved at the firms yard until it was unfortunately burnt and destroyed with lots of other artifacts when the firm left the Higher Meadow Mill. 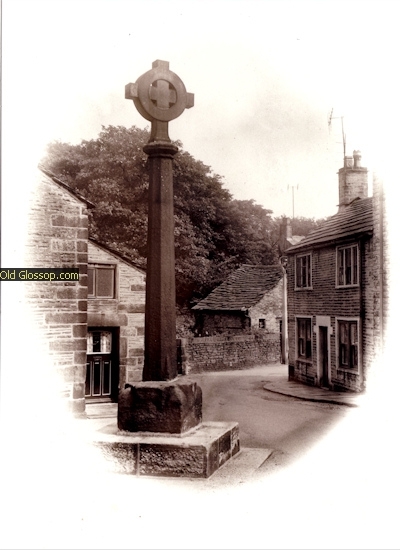 The cross has now been repaired and looks well, However the powers that be did not follow our ancestors common sense and replace /repair the protective corner stones. 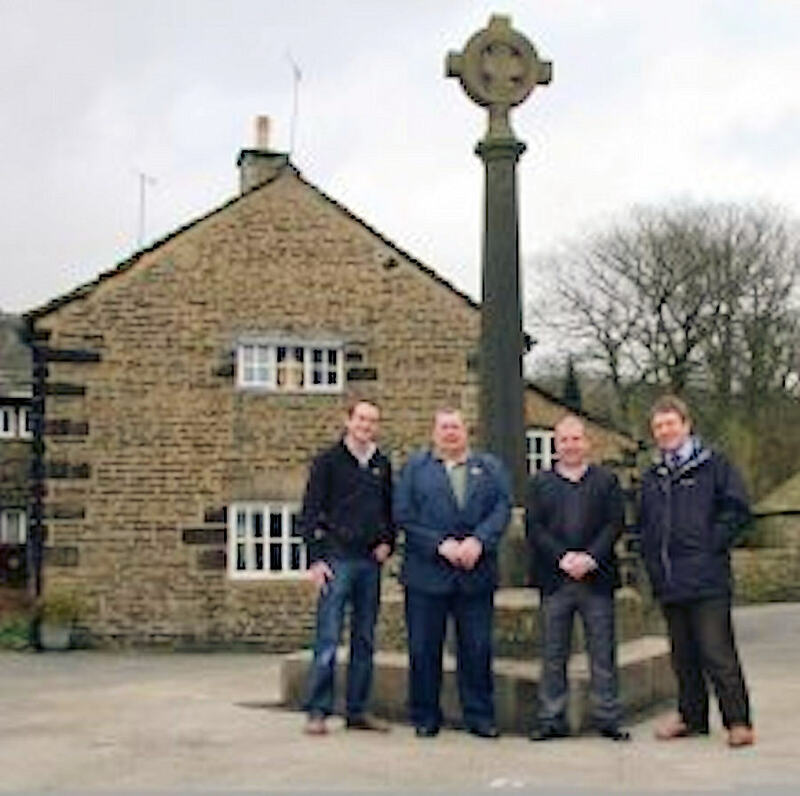 Local contractor, Crofter Construction,did an excellent job on the cross. 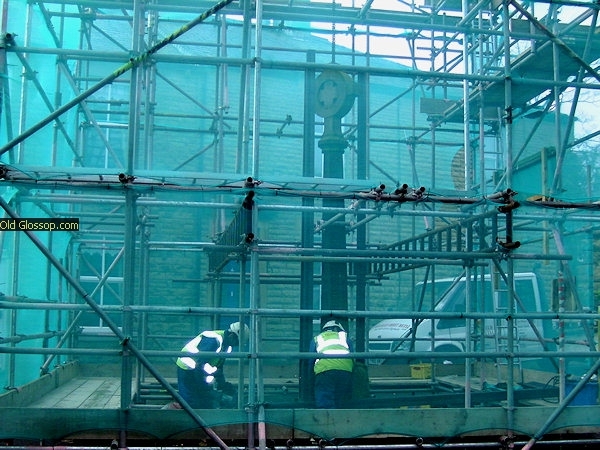 They started work on-site in January on a delicate operation which involved building a steel cage around the monument to form a cradle and allow the cross to be lifted whilst repairs were carried out to the base stones. 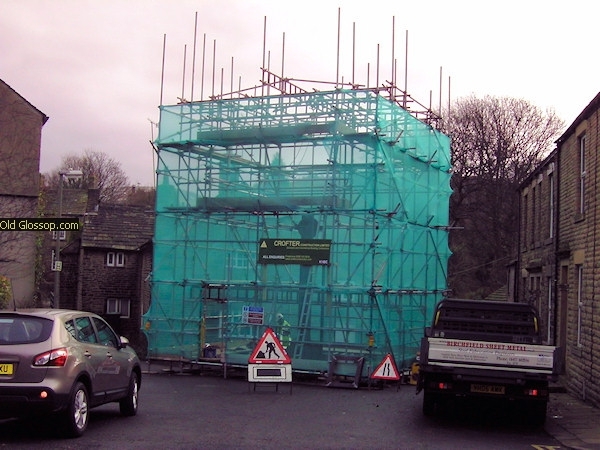 Old Glossop councillors Gary Parvin and Chris Webster joined Oliver and Steve Crowton from Crofter Construction view the completed works.